Become a Beer Pong Master! Bored of 'Drink While You Think' and 'Never Have I Ever'? Looking for a kickass new drinking game to play this weekend? We've got the perfect solution, and its name is BEER PONG. Perhaps you've heard of it. 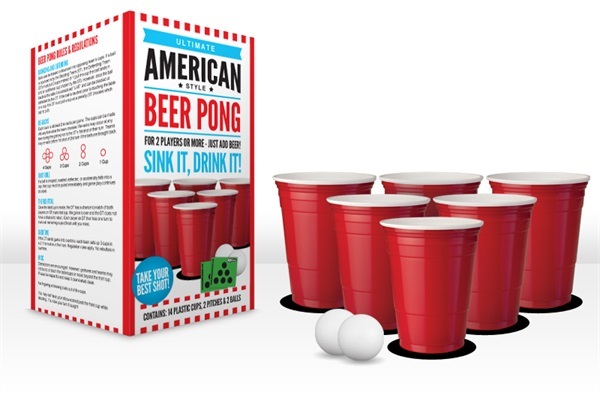 Note that our American Beer Pong Set contains more or less everything you'll need for a game of beer pong. At both ends of the table, arrange 6 cups in a pyramid formation (1 at the front, 3 at the back, 2 in the middle). Pour beer into each of the 12 cups. Keep the two water-filled cups nearby in case the balls need a wash.
Players stand at either end of the table, taking it in turns to throw their ball at the other player's cups. If your opponent's ball lands in your cup, you have to drink the contents of that cup and remove it from play. The first player to run out of cups is the loser. Spin the spinner after every successful shot - anything could happen, including trick shots, cups coming back into play, and players SWITCHING SIDES of the table! Can you land a shot when the cups are teeny-tiny? Why send you son or daughter into school with the same boring calculator as everyone else? This DIY Calculator allows the owner to decorate and doodle on it as they please - they can even write the numbers on in their own unique style! Highlighters always come in handy, no matter what subjects you're taking or which exams you're studying for. These cool highlighter pens are shaped like vitamin pills, and you get loads of different colours in the tub. Remember slap bracelets? They were all the rage in the '90s - you just slapped them on your wrist, and by some black magic, they curled around your arm to form a gaudy fashion accessory. The 'Slap-It-On' Watch follows the same basic principle, and it tells the time, too - no more losing track of time and showing up late to Geography! Every pupil needs a bag, of course (for books and pens and bits of lint), and you'll struggle to find a more striking school bag than this spectacular Superman design. Perfect for comic book fans! New Drinking Stuff - Prepare for the Weekend! Man, Tuesdays are the worst, right? At least you can spend Monday talking about what you did over the weekend - Tuesday is just a no man's land, lightyears from the warm embrace of Friday. "He who waits 'til Friday lunchtime to make plans for Friday night will end up spending Friday in his jammies, watching old Simpsons episodes on his own." However, the man who starts planning his weekend on Tuesday is pretty much guaranteed to have the time of his life. Conveniently enough, we've just added a bunch of new drinking accessories to the Gadget Inspector catalogue - why not start with these, and take it from there? Drink a whole yard of ale and find out whether you're a 'Wimp' or a 'Solid Legend'. What better way to kick off your weekend? It's the perfect way for science boffins to store their wines and spirits! If the party is happening at your house this Friday, somebody's bound to ask you for a bottle opener at some point. How cool will you feel when you hand them a bottle opener that's shaped like a HAMMER? We've saved the best 'til last - this revolving drinks caddy has room for 4 different bottles, and it lights up when you pour, AND it's spring-loaded to give a perfect 1.5oz shot without any effort on your part! How awesome is that? We hope that's given you a few good ideas for the coming weekend. And next time you come down with a case of The Tuesday Blues, remember: you're never more than 120 hours from the next weekend!